Some university officials are complaining about the cost of the new overtime rule, which requires that salaried employees who make less than $47,476 and who work more than 40 hours a week get paid for their overtime. But the costs associated with the new overtime rule will have a minimal impact on universities and colleges. The majority of workers at universities, including faculty, graduate student assistants, and adjuncts, are exempt from the overtime rules. 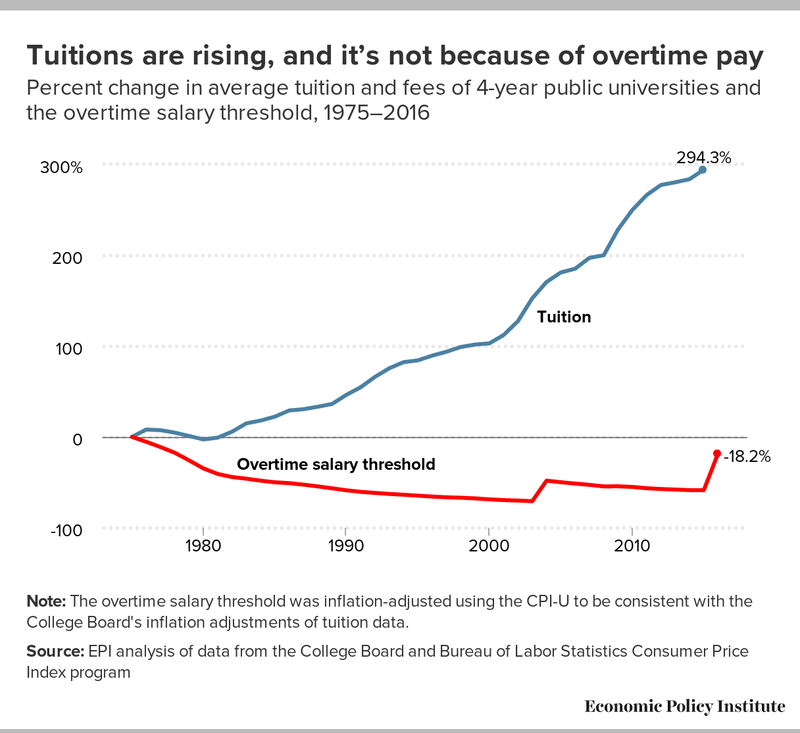 Claims that paying more overtime will cause tuition to rise strains credulity because, as the figure below shows, as overtime protections eroded over the last 40 years and removed the guarantee of overtime pay from millions of salaried employees, tuition soared. Tuition has risen dramatically without any contribution from overtime regulation. Note: The overtime salary threshold was inflation-adjusted using the CPI-U to be consistent with the College Board's inflation adjustments of tuition data. The percent change in average tuition was calculated off of values in constant 2015 dollars from the College Board data. Digging into the numbers Michael Rounds of the University of Kansas (KU) brought to a congressional hearing, the estimated number of affected workers (354) amounts to just seven percent of its employees. Of the 354 affected employees, 92 are postdoctoral fellows, employees who conduct research for the institution after receiving a Ph.D. Many of these positions are funded by grants offered by the National Institutes of Health, which has pledged to increase the grants to encourage compensation among postdocs to reach or exceed the new overtime salary threshold. Consider some of the estimates of purported costs by some university systems: Kansas University ($2.9 million), Iowa Community Colleges ($12.6 million), and the State University System of Florida ($62 million). As a share of these school systems’ budgets, even these grossly exaggerated1 costs are rather manageable at just 1.2 percent, 1.5 percent, and 0.6 percent of their budgets, respectively. There are dozens of factors that do put economic pressures on universities, including reductions in state funding (Kansas cut state support for KU by $7 million in 2016), expensive athletic departments, a huge growth in the numbers of highly compensated executives and administrators, and building new facilities. Overtime protection ensures that more working people, including the ones at universities, are paid for every hour they work. Yes, it will require adjustments as universities comply with the new rule, but to claim that raising the overtime salary threshold will force universities to drastically raise tuition or cut services is just not true. 1. The College and University Professional Association for Human Resources, which prepared these estimates, admits that they are based “on raising all exempt salaries to meet the new threshold.” That is not what the rule requires, and this technique balloons the cost of the rule beyond any reality. For example, a $25,000 a year registrar’s office staffer who might be entitled under the new rules to $2,000 of overtime pay for working long hours during student enrollment, is instead calculated to receive a $22,476 pay increase.